I guess you could say “God will get you!” when you cross ethical lines. Susan G. Komen for the Cure has certainly reaped its reward for carelessness (greed?) when choosing a cause-marketing partner. The blogsphere has been running pink as the good will drains out of SGK’s partnership with KFC, viewed as a purveyor of obesity and carcinogens. The basic benefit of cause-marketing — good publicity for both partners — certainly hasn’t materialized. The cancer-causing contents of KFC chicken are being widely publicized and the brand of SGK has been tarnished. Questions have been raised by all kinds of media, including The Washington Post and The Huffington Post (two, one general, one specifically about pesticides and their link to corn, chickens and cancer) to which Andrea Rader’ SGK’s director of commnications, responded with dollar amounts of SGK’s contributions to research and education. From the nonprofit view, Cause Marketing Forum posted a detailed critique of the partnership then, to its credit, published a full response from Margo Lucero, SGK’s director of Global Corporate Relations. Lucero, like Rader, points to the millions of dollars that will be raised for breast-cancer education and testing. She adds that the organization was well aware of the potential for criticism and asked KFC to emphasize its grilled chicken options. Bad answer; the National Cancer Institute has some cancer-related concerns about grilling as well. In all its responses, SGK seems to be saying “The end justifies the means.” More money for our cause is all the matters, never mind the health implications for our supporters, KFC’s customers, or for those fighting obesity and heart disease. Repeatedly the responses list what SGK will do with the money while failing to address the possibility of doing harm. It’s all about the bottom line. Or is it? Not to the public, including breast cancer suvivors. SGK lost site of ethics by letting the potential for millions of dollars in its own coffers, for its own particular kind of cancer, outweigh its responsibility to what it represents: ending cancer and helping women survive to lead long, healthy lives. Instead, it promoted consuming unhealthy food to raise money for good health. How could the board of directors have missed the ethical flaw in that? It is such a glaring oxymoron! SGK may be more ashamed than it is letting on. 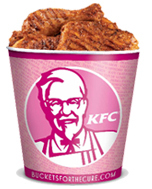 Its Facebook page does not have a link to information about pink buckets and KFC, nor does SGKs “partners and sponsors” link on its homepage list KFC. The homepage does have a link to “5 Questions to Ask” before supporting any cause-marketing effort. Its board should have read them. But, in an perverse twist of fate, the KFC/SGK alliance has caused an upsurge in information about breast cancer and its causes, including the risks of a high fat diet, and meat and fowl cooked at high temperatures. One of SGK’s stated reasons for entering the pink bucket partnership in the first place was to educate people about breast cancer. Seems that goal is being reached. But at what cost to SGK’s image and to the health of women in general? Geri Stengel is founder and President of Ventureneer, an online education and peer support service. PreviousAre Business Schools to Blame for the Financial Crisis?